Discussion in 'Non-Indian Domains' started by Prashant Sharan, Apr 17, 2019. Let's look at the market's performance on 16th April, 2019. The top sale of the day was WB9.com which sold for $6,000 at Sedo. NameBio recorded 366 sales $100+ for a total of $165,967 with an average sale price of $453. Compared to the previous day there was a decrease of 4% in the number of sales and the total dollar amount decreased by 9%. We also recorded an additional 1,329 sales below $100 for a total of $33,957. 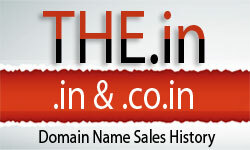 The domain Adviced.com sold for $1,001 at NameJet for an increase of 901%. It last sold for $100 on May 24th, 2016 at NameJet. The domain QIK.io sold for $530 at Park.io for an increase of 263%. It last sold for $146 on March 11th, 2017 at Park.io. The domain Hoffa.com sold for $1,075 at GoDaddy for a decrease of 57%. It last sold for $2,500 on July 13th, 2017 at NameJet. The domain PlacesVR.com sold for $142 at GoDaddy for a decrease of 95%. It last sold for $3,000 on June 28th, 2016 at Sedo.